Purchase this product now and earn 1,799 Reward Points! 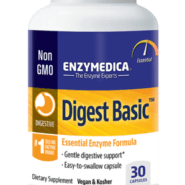 Digest Basic™ is a gentle potency digestive formula which contains the essential enzymes needed to support the proper digestion of all four major food groups. Suggested Use: Take one capsule with every meal for enhanced digestion. More may be taken if needed or desired. 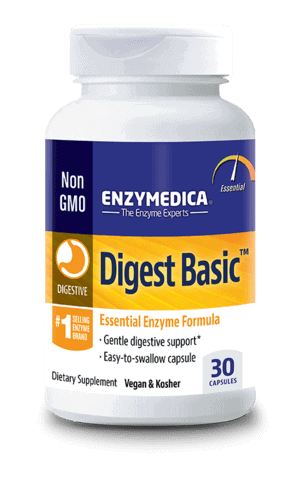 The experts at Enzymedica are proud to offer Digest Basic™ which is intended as an introductory enzyme product that is appropriate for the entire family . This formula utilizes Enzymedica’s exclusive Thera-blend™ technology for blending the plant based enzymes protease, lipase, amylase, and cellulase. They are essential enzymes that assist in the digestion of proteins, fats, carbohydrates, dairy products, and fiber. They also exist in a broader PH range that creates the ability to break down more bonds. In simple terms, thera-blends work longer in the body and have further reaching abilities than single enzyme products possess on their own. Digestive enzymes are critical since they convert the food one consumes each day into usable energy for the body. This process can increase immunity and prolong the longevity potential for overall optimal health. Raw foods alone are not enough to produce the amount of digestive enzymes ideal for the maintenance and repair of living cells. Because of the processed and mainly cooked nature of the modern diet and the toxins humans have to endure each day, the majority of enzymes a person can benefit from are destroyed on a regular basis. This is why Enzymedica is here to introduce natural digestive alternatives to seemingly inevitable enzyme deficiencies, with products like Digest Basic, which is an 100% vegan/vegetarian system that contains no fillers (chemical or otherwise) and is free of common allergens such as gluten, soy and casein. The capsules are also engineered to be small enough to accommodate those who on average have trouble swallowing capsules. It is also an excellent choice for people who have experienced sensitivity to high potency digestive enzyme supplements in the past.